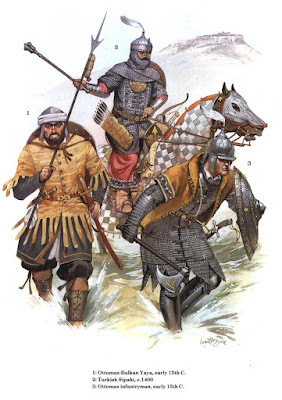 Years earlier, when the state of the Anatolian Seljuks had developed into a fully formed Islamic sultanate, three border areas had been identified as marcher lands that could be more easily defended if fanatical Muslim ghazis were allowed to operate there. In the south such ghazi raids were directed against the Christian lands of Lesser Armenia and Cyprus. In the north the main effort was made against the Christian empire of Trebizond (Trabzon). The western marches, where the Ottomans emerged, lay along the Byzantine frontier. The marches were wild frontier lands where nomads driven there by the Seljuks and refugees from the Mongol conquests came together to seek a better life. In each of these areas Seljuk interests were maintained by a hereditary emir (commander) of the marches. The main military strength within the marches, however, lay with the Turcoman tribes under their own beys (leaders), who were linked to the emirs through bonds of personal loyalty. These were nonetheless unstable organisations that could dissolve and re-form under up-and-coming ghazis. To the chroniclers of the Seljuk state such men were useful but unreliable robber barons prone to rebellion at a moment's notice. The Ottoman beylik was one among several principalities that prospered initially at the expense of their Byzantine neighbours. Their new lands were strictly speaking part of the marches that came under the successive jurisdiction of the local emir, the Seljuk sultans and the Mongol Ilkhans. In reality, however, the ghazi beys regarded themselves as being independent in the former Byzantine territories that they had conquered. Ghazis and champions striving in the way of truth and the path of Allah, gathering the fruits of ghaza and expending them in the way of Allah, choosing truth, striving for religion, lacking pride in the world, following the way of the Sharia, taking revenge on polytheists, friends of strangers, blazing forth the way of Islam from the East to the West. The Ottoman Empire lived for war. Every governor in this empire was a general and every policeman was a Janissary. Every mountain pass had its guards and every road had a military destination. It was a commitment that stretched to the very top of Ottoman society. At the siege of Baghdad in 1683, when the Persians demanded that the contest be decided by single combat, Sultan Mehmet IV took on the task himself and killed the Persian champion. 'For this I was born, to bear arms,' said Bayezid the Thunderbolt, and when a European visitor got the chance to see Mehmet the Conqueror's army in the field in 1462 he surmised that such splendid troops could conquer all of Europe if they chose. As the empire expanded the 'marches' of the Ottoman lands moved to the Balkans, where marcher traditions similar to the old patterns soon developed. The expression ghazi gave way to akinji (raiders), who tended to be volunteers from Anatolia drawn to the frontier lands by the prospect of gaining a timar (fief), for themselves. The akinji were used by the Ottomans as an auxiliary militia for intelligence gathering in enemy territory. Renegade Christians were often recruited into their ranks. The akinji usually set off on a raid each equipped with two horses, and were organised in units of tens, hundreds and thousands. As the Ottoman light cavalry the akinji carried a sword, a shield, a scimitar a lance and a mace. Leaders called sanjak bey (provincial leaders) commanded them. 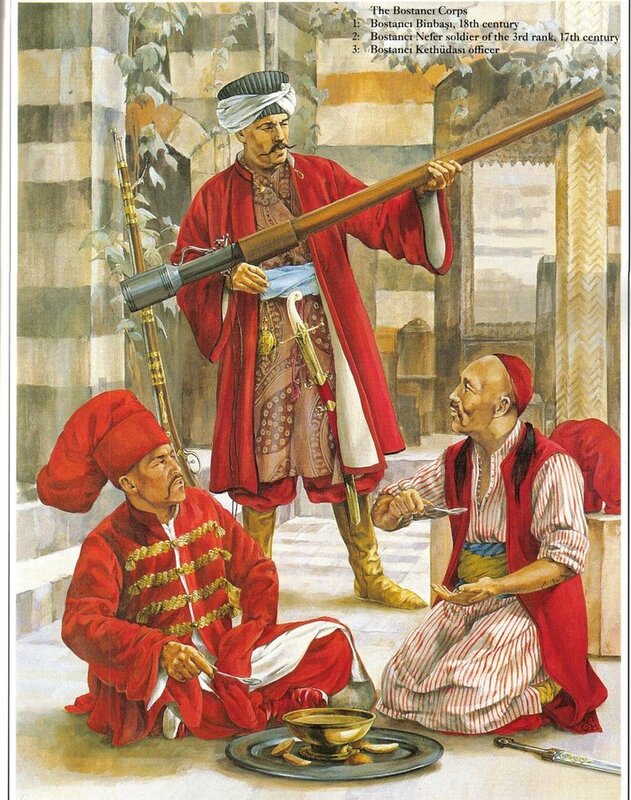 Casual raiding became a less frequent occupation as the empire grew and by the time of the battle of Mohacs in 1526, the akinji were well accustomed to being employed for penetrating enemy territory ahead of the main Ottoman Army. They would secure bridges and take prisoners for interrogation. The akinji bands roamed far and wide, and never were they more enthusiastic than when they marched with the Sultan in the vanguard of his army as they hoped to be rewarded for their skill by promotion to the ranks of the regular army. It was every horseman's dream to enrol in the permanent army and receive the stipend known as a timar that would free him from economic worries and allow him to concentrate on war. He would then also be the recipient of a certain number of imperial taxes himself, even though the Ottoman Sultan owned all the land. In one particularly bloody assault a single timar was awarded and then re-awarded eight times after the previous recipients died fighting. At the siege of Belgrade the Janissaries stormed the walls over a moat filled with dead akinji. The famous Janissaries were the elite of the Ottoman Army and for centuries were ranked among the finest infantry in Europe. They were originally recruited exclusively from the products of a system whereby Christian boys of between about eight and 15 years of age were selected from the conquered territories as 'tribute children'. They were trained in Turkish speech and customs and converted (often willingly) to Islam. After a period of intense physical training they were drafted into either the army or government posts according to their abilities. In the former case they filled the ranks of the Janissaries, whose status as 'slave soldiers' is totally misleading in view of the high office that was open to them and the immense trust placed in them. 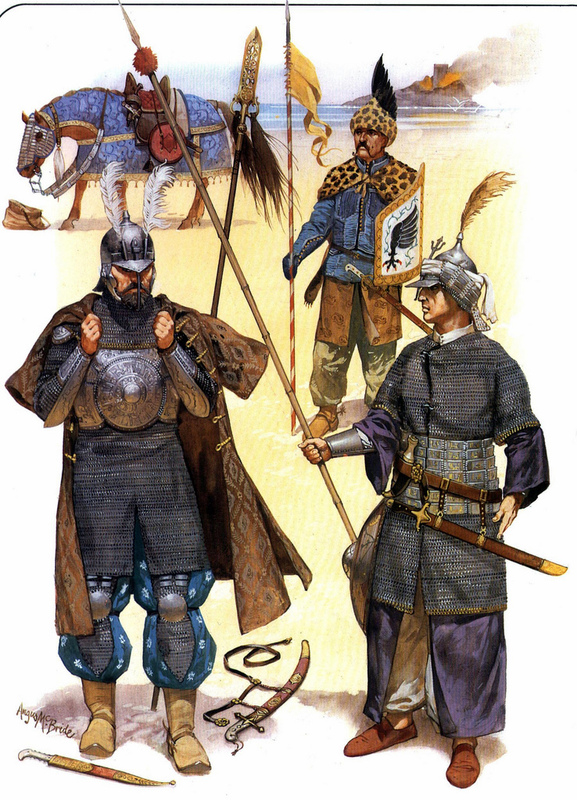 Some janissary units provided the Sultan's bodyguard. At the battle of Varna in 1444 the formidable janissaries occupied the centre positions with a ditch around them. Behind them stood the camels, while further behind was a breastwork of shields fixed to the ground in front of the other janissaries who guarded the Sultan. It is worth noting the additional presence in the marches of the sipahis (free cavalrymen) who were loyal to the local bey. The Sipahis were invariably Muslim Turks. They were scattered across the empire, always on the move from billet to billet, and from billet to the front line. Even madmen had their own regiment: the deli, or maniacs, the 'riskers of souls' who allowed themselves to be used as human battering rams. The Ottomans were the first state to maintain a standing army in Europe since Roman times - paid, fed and unleashed through unsurpassable feats of organisation. When they marched on Persia in 1548 they were so well provisioned that they could cheerfully ignore the scorched earth landscape created by the Shah. Nowhere was their organisation better displayed than in camp. Western military camps were babels of disorder, drunkenness and debauchery. The Ottoman camps were disturbed by nothing louder than the sound of a mallet on a tent peg. 'I think there is no prince', wrote the chronicler Chalkondylas, 'who has his armies and camps in better order, both in abundance of victuals and in the beautiful order they use in encampment without any confusion or embarrassment.' 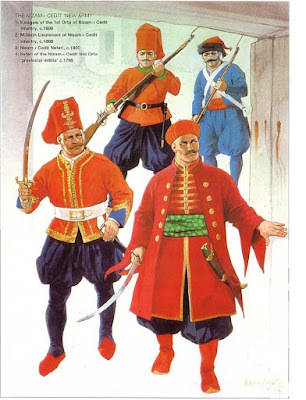 Also, while western rulers needed to cajole or threaten their vassals the Ottoman armies assembled like clockwork. Their transport camels gave them a keen logistical advantage and the Ottomans always carefully analysed the problems of war. liach winter the previous year's campaigns were subject to a stringent post-mortem enhanced by reports from a network of spies. Weaknesses would be noted and plans made for the coming year.